For other people known as Henry, Prince of Wales, see Henry, Prince of Wales. Henry Frederick, Prince of Wales KG (19 February 1594 – 6 November 1612) was the elder son of James VI and I, King of England and Scotland, and his wife, Anne of Denmark. His name derives from his grandfathers: Henry Stuart, Lord Darnley, and Frederick II of Denmark. Prince Henry was widely seen as a bright and promising heir to his father's thrones. However, at the age of 18, he predeceased his father when he died of typhoid fever. His younger brother Charles succeeded him as heir apparent to the English, Irish and Scottish thrones. Henry was born at Stirling Castle, Scotland and became Duke of Rothesay, Earl of Carrick, Baron of Renfrew, Lord of the Isles and Prince and Great Steward of Scotland automatically on his birth. Henry's baptism on 30 August 1594 was celebrated with complex theatrical entertainments written by poet William Fowler and a ceremony in a new Chapel Royal at Stirling purpose-built by William Schaw. His father placed him in the care of John Erskine, Earl of Mar at Stirling Castle, out of the care of the boy's mother, because James worried that the mother's tendency toward Catholicism might affect the son. Although the child's removal caused enormous tension between Anne and James, Henry remained under the care of Mar's family until 1603, when James became King of England and his family moved south. One of his tutors until he went to England was Sir George Lauder of the Bass, a Privy Counsellor – described as the King's "familiar councillor" – and he was also tutored in music by Alfonso Ferrabosco the younger. Henry's tutor Adam Newton continued to serve the Prince in England, and some Scottish servants from Stirling were retained, including poet David Murray. The king greatly preferred the role of schoolmaster to that of father, and he wrote texts for the schooling of his children. James directed that Henry's household "should rather imitate a College than a Court", or, as Sir Thomas Chaloner wrote in 1607, His Highness's household [...] was intended by the King for a courtly college or a collegiate court" He passionately engaged in such physical pursuits as hawking, hunting, jousting and fencing, and from a young age studied naval and military affairs and national issues, about which he often disagreed with his father. He also disapproved of the way his father conducted the royal court, disliked Robert Carr, a favourite of his father, and esteemed Sir Walter Raleigh, wishing him to be released from the Tower of London. The prince's popularity rose so high that it threatened his father. Relations between the two could be tense, and on occasion surfaced in public. At one point, the two were hunting near Royston when James criticised his son for lacking enthusiasm for the chase, and Henry initially moved to strike his father with a cane, but rode off. Most of the hunting party then followed the son. "Upright to the point of priggishness, he fined all who swore in his presence", according to Charles Carlton, a biographer of Charles I, who describes Henry as an "obdurate Protestant". In addition to the alms box to which Henry forced swearers to contribute, he made sure his household attended church services. His religious views were influenced by the clerics in his household, who came largely from a tradition of politicised Calvinism. Henry listened humbly, attentively, and regularly to the sermons preached to his household, and once told his chaplain, Richard Milbourne, that he esteemed most the preachers whose attitude suggested, "Sir, you must hear me diligently: you must have a care to observe what I say." Henry is said to have disliked his younger brother, Charles, and to have teased him, although this derives from only one anecdote: when Charles was nine years of age, Henry snatched the hat off a bishop and put it on the younger child's head, then told his younger brother that when he became king he would make Charles Archbishop of Canterbury, and then Charles would have a long robe to hide his ugly rickety legs. Charles stamped on the cap and had to be dragged off in tears. 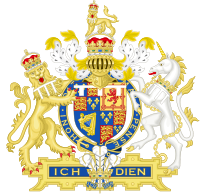 With his father's accession to the throne of England in 1603, Henry at once became Duke of Cornwall. In 1610 he was further invested as Prince of Wales and Earl of Chester, thus for the first time uniting the six automatic and two traditional Scottish and English titles held by heirs-apparent to the two thrones. As a young man, Henry showed great promise and was beginning to be active in leadership matters. Among his activities, he was responsible for the reassignment of Sir Thomas Dale to the Virginia Company of London's struggling colony in North America. The Irish Gaelic lord of Inishowen, Sir Cahir O'Doherty, had applied to gain a position as a courtier in the household of Henry, to help him in his struggles against officials in Ireland. Unknown to Sir Cahir, on 19 April 1608, the day he launched O'Doherty's Rebellion by burning Derry, his application was approved. Henry took an interest in the Kingdom of Ireland and was known to be supportive of the idea of a reconciliation with the former rebel Hugh O'Neill, Earl of Tyrone, who had fled into exile during the Flight of the Earls. Because of this Tyrone and his entourage mourned when the Prince met his early death. Henry died from typhoid fever at the age of 18, during the celebrations that led up to his sister Elizabeth's wedding. (The diagnosis can be made with reasonable certainty from written records of the post-mortem examination, although at the time there were rumours of poisoning.) He was buried in Westminster Abbey. Prince Henry's death was widely regarded as a tragedy for the nation. According to Charles Carlton, "Few heirs to the English throne have been as widely and deeply mourned as Prince Henry." His body lay in state at St. James's Palace for four weeks. On 7 December, over a thousand people walked in the mile-long cortège to Westminster Abbey to hear a two-hour sermon delivered by George Abbot, the Archbishop of Canterbury. As Henry's body was lowered into the ground, his chief servants broke their staves of office at the grave. An insane man ran naked through the mourners, yelling that he was the boy's ghost. Immediately after Henry's death, the prince's brother Charles fell ill, but he was the chief mourner at the funeral, which his father, King James (who detested funerals) refused to attend. Henry's titles of Duke of Cornwall and Duke of Rothesay passed to Charles, who until then had lived in Henry's shadow. Four years later Charles, by then sixteen years old, was created Prince of Wales and Earl of Chester. Portrait aged 13 or 14. He stands on a shield bearing his Prince of Wales's feathers. Royal Palace of Turin. Lamentations for the death of the late illustrious Prince Henry [...] Two Sermons (1613; see 1613 in literature): "Oh, why is there not a generall thaw throughout all mankinde? why in this debashed Ayre doe not all things expire, seeing Time looks upon us with watry eues, disheveld lockes, and heavie dismall lookes; now that the Sunne is gone out of our Firmament, the ioy, the beautie, the glory of Israel is departed?" Spirituall Odours to the Memory of Prince Henry. In Four of the Last Sermons Preached in St James after his Highnesse Death (Oxford, 1613; see 1613 in literature) From "Meditations of Consolation in our Lamentations": "[...] his body was so faire and strong that a soule might have been pleased to live an age in it [...] vertue and valor, beauty and chastity, armes and arts, met and kist in him, and his goodnesse lent so much mintage to other Princes, that if Xenophon were now to describe a Prince, Prince HENRY had been his Patterne. [...] He hath gon his Passover from death to life, where there is more grace and more capacity [...] where earthly bodies shalbe more celestiall, then man in his Innocency or Angels in their glory, for they could fall: Hee is there with those Patriarchs that have expected Christ on earth, longer than they have enjoyed him in heaven; He is with those holy Penmen of the holy spirit, they bee now his paterns, who were here his teachers [...]"
Teares Shed over Abner. The Sermon Preached on the Sunday before the Prince his funerall in St James Chappell before the body (Oxford, (1613; see 1613 in literature): "He, He is dead, who while he lived, was a perpetuall Paradise, every season that he shewd himselfe in a perpetuall spring, eavery exercise wherein he was scene a special felicity: He, He is dead before us [...] He, He is dead; that blessed Model of heaven his face is covered till the latter day, whose shining lamps his eyes in whose light there was life to the beholders, they bee ecclipsed until the sunne give over shining. [...] He, He is dead, and now yee see this [...]"
Prince Henry His First Anniversary (Oxford, 1613; see 1613 in literature): "in HIM, a glimmering light of the Golden times appeare, all lines of expectation met in this Center, all spirits of vertue, scattered into others were extracted into him [...]"
Within a few months of the prince's death, at least 32 poets had versified on it. In addition to those listed below, the writers included Sir Walter Ralegh (a friend), John Donne, Edward Herbert, Thomas Heywood and Henry King. In addition to the above verse-setting by Coperario, both Thomas Tomkins and Thomas Weelkes composed settings of "When David heard", a Biblical passage in which King David laments the loss of his son Absalom in battle; it is thought that both settings were directly inspired by the death of the prince. The Oxford Dictionary of National Biography refers to a mourning song in memory of Prince Henry by John Ward remaining unpublished during the composer's lifetime; however, a "newly composed" song on the same subject was included in his First Set of Madrigals (1613). Henry Frederick as Prince of Wales bore the arms of the kingdom, differenced by a label argent of three points. ^ Graham Ross, notes to Harmonia Mundi recording Remembrance, HMU907654 (2016). ^ “Ward, John (bap. 1590, d. 1638),” Ian Payne in Oxford Dictionary of National Biography, See online ed., ed. Lawrence Goldman, Oxford: OUP (subscription or UK public library membership required). http://www.oxforddnb.com/view/article/28689 (accessed November 14, 2014). Cornwallis, Charles (1738). Life and Character of Henry-Frederic, Prince of Wales. London. McCavitt, John (2002). The Flight of the Earls. Gill & MacMillan. Williamson, J. W. (1978). The Myth of the Conqueror: Prince Henry Stuart, a Study in 17th Century Personation. New York, AMS Press. Roy Strong (2000) . Henry, Prince of Wales and England's Lost Renaissance. London: Pimlico. Timothy Wilks, ed. (2007). Prince Henry Revived: Image and Exemplarity in Early Modern England. Southampton Solent University: Paul Holberton Publishing.